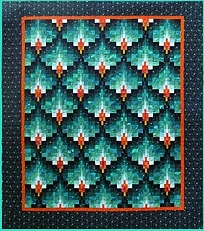 I have written about the progress of this quilt in some of my earlier posts. Two days ago I got it back from the longarm quilter, Anne Rønningen at Quiltekammeret, who did a wonderful job of quilting it. Then I rushed to sew on the binding so it would be finished in time for the Bloggers Quilt Festival, which Amy at Amy’s Creative Side is hosting once again. I put in the last stitches an hour after the sun set yesterday, but since our nights are getting lighter at this time of year, it was still possible to get some fairly decent photos outside at ten pm. After my father passed away nearly two years ago, my mother wondered what to do with his shirts. She did not want to just throw them out, so I offered to try to make something out of the material. I came home with a stack of shirts of very different fabric qualities and colours. I went for a simple block design, and one of the goals I set for myself for this quilt, was to use some fabric from every shirt, and that every block should have different colour and fabric combinations. With so many fabrics available, that was not too difficult. The fabric qualities varied from quite heavy cotton, to polyester blends and silk, and there were also different levels of wear to the fabrics. I still wanted to include the ones that were most worn as those were the ones we all remember the best. Despite the varieties in fabric thickness and stretch, Anne did a wonderful job with the quilting. She sent me the photo above, which was taken by her while the quilt was still in the quilting frame, and which got me positively dribbling with anticipation. I was not disappointed when the quilt arrived here shortly after. This is the fifth time I take part in the Bloggers Quilt Festival. 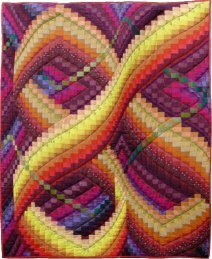 Do not forget to go to Amy’s site and have a look at all the wonderful festival quilts. A wonderful quilt! And a great memory to your father! Beautiful, Eldrid, I loved the quilt and was going to comment about the fabrics you chose, but have to admit that realizing they were your Father’s shirt brought tears to my eyes. A very special quilt, and I thank you so much for sharing it with us! Thank you very much, Valentina. The fabrics are sort of “outside my usual style”, so therefore all the more interesting to work with. Eldrid, it’s lovely! Such a wonderful story for the quilt… and I love how you placed the color. It’s beautiful – and that quilting is fantastic too. Love it! This is great. I love quilts like these, full of memories. Thank you 🙂 Working on this quilt was special. Looks great – the red really lifts it and Anne did you proud with the quilting. Well done to you both. This is a great quilt with a great story! Very nice! I love this very special quilt. Great job. Very nicely done. The colors blend beautifully. Your quilt from previous years were stunning. Thanks for sharing. You have done a great job with all the colour combinations in the blocks. I love the idea of making a memory quilt using all the shirts. Your quilt looks great. 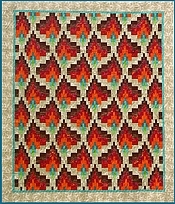 Love the quilting, too! This is such a pretty quilt and I love the circle quilting over the squares. I also think that the circular lines make a good contrast with the blocks. Many years ago I saw a log cabin quilt in a book that was quilted with circular lines, and I have since been wanting to do something similar. Thank you, Eileen. It was my first go at something like this, and memory quilts are special projects in so many ways. I hope you will find some of your father’s shirts. I love your quilt. What a wonderful tribute to your father. Your quilt is so awesomne! Nydelig teppe, og et utrolig flott minne om din far. Og quiltingen er bare lekker! This is lovely. Many happy memories here for sure. I, too, have made such a quilt. For the widow of my husband’s cousin, who was taken by cancer much too young. I used an iron-on stabiliser on the viscose and silks. My machine quilter did an excellent job with it and it came up beautifully. I found it happy and sad to make such a quilt, and hope not to make another anytime soon. I love your quilt! I featured it on my blog today. 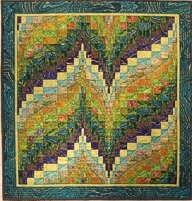 I love to return to your blog to look at this quilt many times. I’m sure it was not easy combining those different fabrics but you made it work so well and it is such a nice way to celebrate your father’s life.